ProRend External Insulation Finishing System (EIFS) is a complete render solution. Available in two primary construction methods: Adhesive (with secondary mechanical fixings; suitable for uneven substrates and curved walls using mineral wool lamella), and rail (which mechanically holds the edges of the insulation; suitable for uneven substrates). Building Regulations Approved Documents B ('Fire Safety') and L ('Conservation of Fuel and Power')-compliant. Zero Ozone Depletion Potential (ODP) and zero Global Warming Potential (GWP). ProRend Colourtex (with primer) or ProRend Mineraltex. 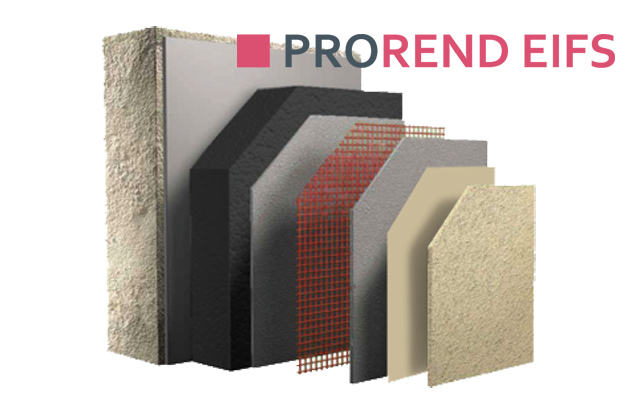 ProRend EIFS insulation systems: >20% clarity. Rail edge: 500 x 500 mm. Manufactured to BS EN 13163:2001. Fire classification: E (contains fire-retarding additive). Water vapour permeability to BS EN ISO 10456, Table 4: 60/60. Nominal density: 14–16 kg/m³ (70 white and platinum). 30–32 kg/m³ (200 white). Water vapour permeability to BS EN ISO 10456, Table 4: 1/1. ProRend EIFS adhesive EPS applications using mineral wool lamella. ProRend EIFS rail EPS applications using mineral wool rail slab. 12 standard colours plus RAL, NCS, BS 4800, Sto, K Rend, Parex and Weber colour matches available; insert requirements. Available in grained or uniform texture. White as standard, also available Cream, Ivory or Wheat. Can be painted with ProRend water-repellent masonry paint or ProRend self-clean masonry paint. Masonry paints can be tinted to over 35 000 colours including RAL, NCS or BS colours; consult manufacturer for details. The product information below is from the NBS Plus library of product clauses offered in NBS specification products. It has been created by NBS for SAS Europe Ltd. Each product clause is authored in NBS format and is intended for inclusion in project specifications. Please note that NBS product guidance is not a replacement for the manufacturer's literature and it is recommended that SAS Europe Ltd be consulted before specifying. Standard. Thermal conductivity: 0.037 W/m·K. Dense insulation, ideally suited to applications below damp-proof course. Thermal conductivity: 0.033 W/m·K. Available in various thicknesses and suitable for curved walls. Insert requirements. Thermal conductivity: 0.040 W/m·K. Only suitable for use with EPS primary insulant. With stainless steel rails and intumescent strip. See 'Options' and insert requirements. Includes colour-matched Colourtex primer. See 'Options' and insert requirements.